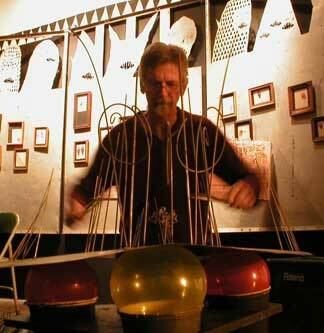 has designed, built and performed with original musical instruments since 1976, having received a B.Mus. and M.A. in music composition from the University of Texas at Austin and S.U.N.Y. Stony Brook, and post-graduate work at U.C. San Diego. His instruments typically utilize commonly available materials, are sculptural in appearance, utilize contact microphones for amplification, and are designed specifically for improvisation with elements of ambiguity, unpredictability and nonlinearity. He has appeared on a number of recordings, including his most recent solo CD, "Identity." In 1998, he completed writing and self-published Wisdom of The Impulse: on the nature of musical free improvisation, a book that examines various aspects of this illusive art and presents a theoretical foundation for creative listening, analysis and discussion. Tom has also written a number of articles about the use of experimental instruments and improvisation in publications such as Experimental Musical Instruments, Musicworks and Leonardo. Anyone who has hummed against wax paper wrapped around a comb, banged the top of an empty coffee can or plucked a rubber band while stretching it to different lengths knows the appeal of playing homemade musical instruments. For most of his adult life, Tom Nunn has taken that impulse to extremes. The inventor of such intriguingly named devices as Crustacean, Bug, Techphonic Plate, Octatonic T-Rodimba, Sonic Ray and Hybrid Mothics, Nunn is an elder in the Bay Area experimental music scene. Next week, after performing a local CD-release show for his new solo recording, "Identity," he will travel to New Zealand with fellow Northern Californians Walter Kitundu and Bart Hopkin (compiler of the CD/book "Gravikords, Whirlies & Pyrophones") to join four other sonic innovators at the S3D (Ear & Eye) segment of the Auckland Festival, AK07. "That's what made me decide to do a solo CD," Nunn says of the international conclave. "I needed something more up-to-date. And since I have the solo CD, it was a chance to do this concert (at the Luggage Store)." A native of San Antonio and author of the self-published 1998 tome "Wisdom of the Impulse: On the Nature of Musical Free Improvisation," Nunn took his initial left turn into DIY musical instruments when he was a graduate student and teaching assistant for a deceptively titled course at UC San Diego in the mid-1970s. "Music 1" exposed students to the then-radical notions of tape music, music concrete and multimedia, and encouraged them to coax sound from found objects. "It was a get-your-hands-dirty introduction to new music," Nunn recalls, "and it inspired me to become involved in both improvisation and making instruments." Nunn hooked up with two other kindred spirits in the It Project, which held free concerts and workshops for musicians and non-musicians in San Diego parks. In 1978, he bailed from the academic track to a doctorate in composition and moved to San Francisco (toting his Crustacean), determined to "find a way to do this under my terms." His first Bay Area band was a trio called Confluence, with David Poyeaurew and Chris Brown, and Nunn has carried his penchant for collaboration into the present with two trios -- the "introspective" RTD3, with Doug Carroll (cello) and Ron Heglin (trombone, tuba, voice), and the "in-your-face musically and politically absurd" Axallto, with Axel Meyer (sampler) and Allan Crossman (synthesizer and drum machine). Over the years Nunn has built more instruments than he can play; he has given away about 30 of them. "The making of them is not so joyful, frankly," he says. "It's work. It tires your back out, and it's not terribly fun. Fun is designing them and fun is playing them."